As I am writing this we are thirteen hours into our fifteen hour plus flight. For almost a year now I have dreaded this flight. Dreaded the thought of Noah having to sit still that long. So far though the flight has far exceeded my expectations. Noah has done amazing… barely even cried. I think she has done better on this flight than she did in the flight from Memphis to Chicago. All the research I did on what to pack to keep a toddler occupied has payed off. We have filled our time with Play-dough squishing, coloring, sticker collaging, and tv watching. And the most amazing part of the trip is that she has slept around six hours already! 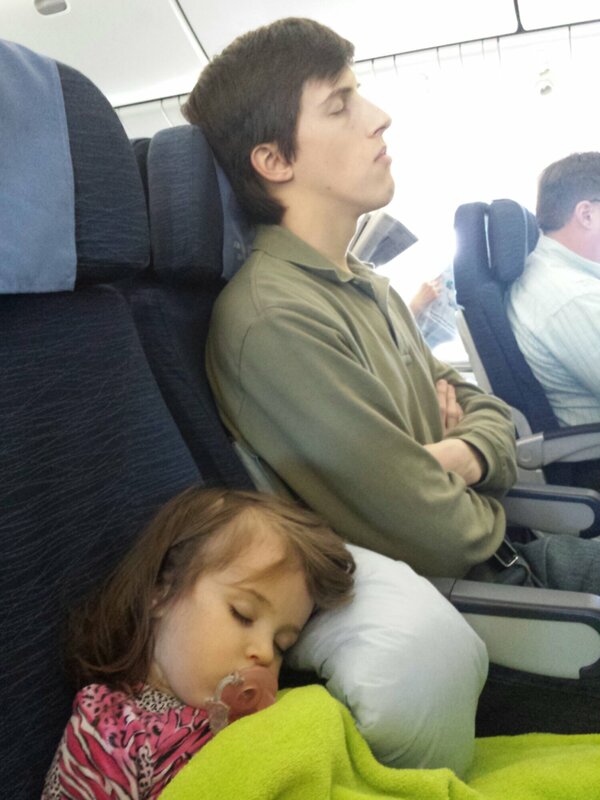 Even falling asleep before takeoff! We woke her up not to long ago so that she will hopefully sleep through the night tonight. It’s definitely going to be an adjustment with the fourteen hour time difference and all. We definitely appreciate everyone’s prayers and have truly felt them during this flight. Even as close as we are to Hong Kong it is still hard for me to grasp that we are only two days away from meeting Esther! We will spend the next two days sight seeing and taking in Hong Kong Disney. It should be an eventful but filled weekend that I look forward to sharing with you! This entry was posted in Adoption, Family and tagged Hong Kong adoption, hong kong adoption blog on 02/07/2014 by Krystle. Glad to hear everything is ok so far. Sure been thinking about you guys! Thank you! We are looking forward to visiting Hong Kong Disney today! So crazy excited for you!!! tons of prayers sent your way for an easy meeting with Ester, good transitioning of the sisters, and a not-awful flight home with 2 little ones!